Handmade home decor pillows and accessories. Announcement Huggable Golden Gate Bridge pillows and many other handmade, unique home decor pillows and accessories. OodleBaDoodle aims to create responsibly by using materials that are reclaimed and recycled. 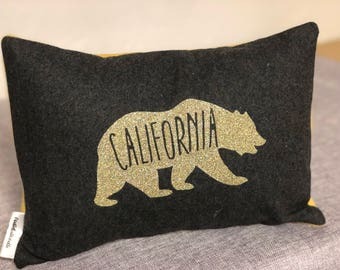 Huggable Golden Gate Bridge pillows and many other handmade, unique home decor pillows and accessories. OodleBaDoodle aims to create responsibly by using materials that are reclaimed and recycled. This is very classy -- beautifully made, and the unicorn is gorgeous. Thank you! Very cute pillow; nicely made ... I’m slightly disappointed in the size. I didn’t realize how small it was before ordering. I wish I would have paid attention to that detail. It would have been better if it was bigger. But overall, it’s cute. I'm Rebecca, designer, creator and innovator. Welcome! I'm Rebecca, owner of OodleBaDoodle, a whimsical line of one-of-a-kind, eco-friendly creations that I design and make in my San Francisco studio. I'm proud to use reclaimed, high-end designer textiles and my sartorial skills to create a line of whimsical home decor pillows. As a community builder and creative entrepreneur, I enjoy making things happen. Since 2013, I've proudly worn the hat of "team captain" for the vibrant SFEtsy Team, one of the largest communities of creative entrepreneurs in the Bay Area. I have used my superpower of networking to help Etsy sellers come together through a variety of local business development programs. As owner and head of design at OodleBaDoodle, I spend my days as a solo-entrepreneur to create a line of whimsical home decor pillows by hand. I develop the patterns, repurpose materials and market and manage all parts of my tiny business. In 2014, I was honored to be named “Collaborator of the Year” for my work with local art program in San Francisco’s Mission District, Ruth’s Table. Additionally, I spearheaded the creation and development of one of the best attended new craft shows in San Francisco. Held at the historic cruise terminal, Pier 35, the SFEtsy Indie Holiday Emporium showcased 180 Etsy sellers and welcomed over 50,000 shoppers. Raised in the Midwest, I now call San Francisco home. When not behind a sewing machine, you'll find me enjoying the city with my husband Chris and two cats, Maximus Milkshake and Midnight. Currently, due to the high demand for my one-of-a-kind pieces, I am only making custom orders with a few extras. 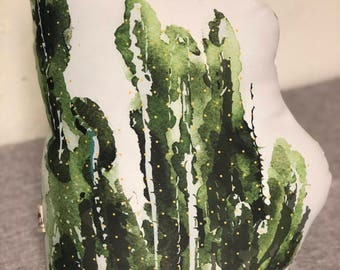 I love making custom pieces, so if you have an idea, send it my way and I can make your huggable creation! Thanks for stopping by! Enjoy these one-of-a-kind OodleBaDoodle pieces, because I definitely enjoy making them! I'm Rebecca, a midwest girl living and creating in San Francisco. My motto is "creating responsibly" because as a maker, I've developed a passion for creating things using reclaimed and recycled materials. Hello Hello! Thank you for visiting OodleBaDoodle! I make and sell items that have been created responsibly using materials that have been reclaimed and recycled. All of my items are good for mother Earth and she says "Thank you for buying responsibly." Because of the custom and handmade nature of my items. I do not offer refunds or returns. If you are not satisfied with your purchase, I will definitely work with you to come up with a happy solution. The buyer is expected to pay for shipping a returned item for exchange. Exchanges are made for items returned in the original condition. Repairs can be made on a case by case basis. I take Paypal and Etsy direct checkout. I will also take your check or money order if you don't mind waiting a bit for your items. Message me if you have questions about payment. All orders are shipped within 3 business days. Shipping charges are stated in each listing. All custom orders will be agreed upon via email prior to a purchase being made. Additionally, colors in images are not always 100% true to the color of the item. They are as close as photography and digital imaging will allow. I, Rebecca Saylor, retain all copyrights and all rights of non-commissioned and commissioned artwork,images,and designs from the moment of creation. Wholesale orders are taken on a case by case basis and are subject to terms and conditions that may change based on need.